mommy bytes: Shipping up to King Richard's Faire! Shipping up to King Richard's Faire! Hear ye! It's time once again to head to Carvershire for King Richard's Faire! This was our second year visiting the enchanted forest. Watch our whole visit below in only one minute and 20 seconds! In case you're wondering how I managed to stitch iOS live photos together, I used the Google Motion Stills app to export the videos and then Videoshop to put all the still photos, live photos and videos together (there's no one magic app to handle live photos). Click the sound on to sing along at the end! The Mud Show by the Sturdy Beggars - this is clearly the loudest show in the land so I wanted to check it out. And true to it's name, it's muddy and bawdy, and somewhat entertaining if you like getting dirty. Notice that we only really had four meals and drinks split between five people (I snatched bites of everyone's food), so your food dollars may vary. But I was glad to actually get a beer this time and chomp on a turkey leg. In the end, we spent less than last year because we kept Master Card and Lady Visa at bay for the pricier merchandise. 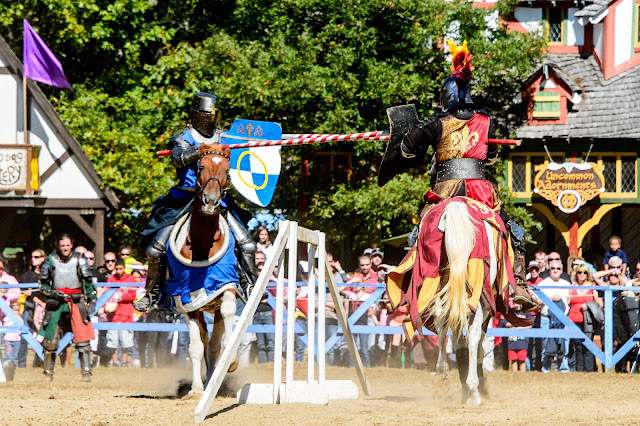 Now it's your turn to visit King Richard's Faire. The knights are waiting! Disclaimer: I received admission tickets courtesy of Dennehy PR, thank you Lady Julie! Great post, Mommy Bytes... love seeing your family spending time together playing the woods... and love the video too! Great post - will share with the King Richard's Faire community on social too. Huzzah!